Christmas decorators know that the tree is essential, that untangling the string lights will be worth the hassle and that the fireplace is a great place to draw the eye with festive decor. But even when you have all of your big pieces in place, your home might not feel like it’s been completely transformed for the holiday season. If you’re looking for that finishing touch, you’ve come to the right place. It’s not always about the big pieces. It’s about the little Christmas accents that can tie rooms together or add the perfect dash of holiday to any area. Luckily, Lakeside has a wide variety of small finishing touches for your home that will make a major impact. Easily add an adorable holiday accent to shelves, mantels, dressers and more. Add a little extra decoration to your home with these cute sitters. Each friendly character is dressed head to toe in holiday attire with fun accents, including unique legs made of buttons. Filled with sand for sturdiness. 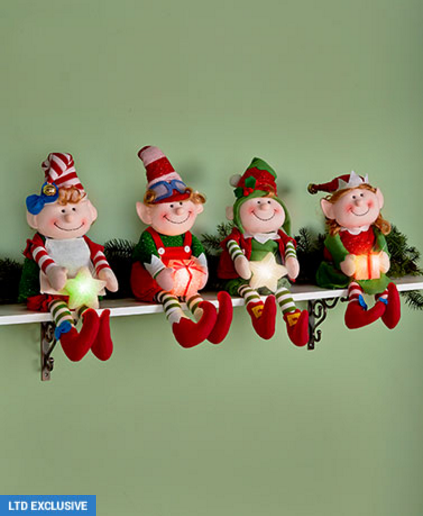 The delightful elves in this collection are ready to spread holiday cheer throughout your home. Each lighted shelf sitter holds a color-changing item and is weighted with sand to keep it in place on your mantel or shelf. Add an adorable accent to your home this season with one of these festive sitters. The classic character is a fun way to celebrate winter in any room. Weighted with sand to sit upright on a shelf with both legs dangling. Bring a little holiday cheer to any flat surface with our festive figurines. 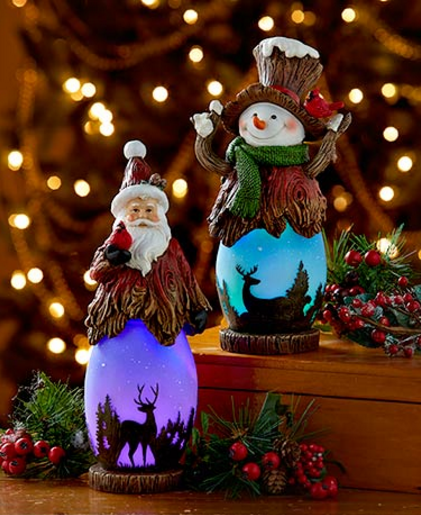 These lighted figures add a colorful, nature-inspired theme to your Christmas decorations. The base of each figure lights up with a magical color, revealing a starry night sky with woodland silhouettes for a wintery feel. Give this angel to someone special to let them know just how important they are. 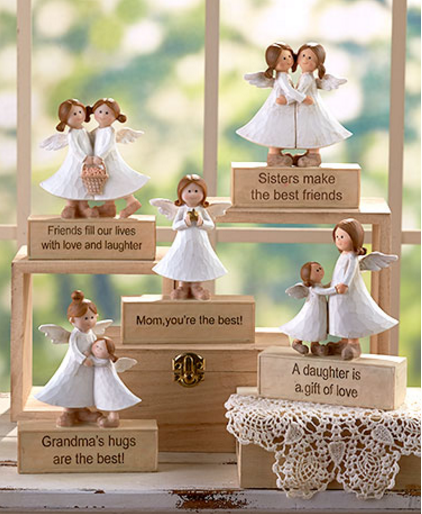 Each angel statue features a sentimental message on its neutral-colored base. 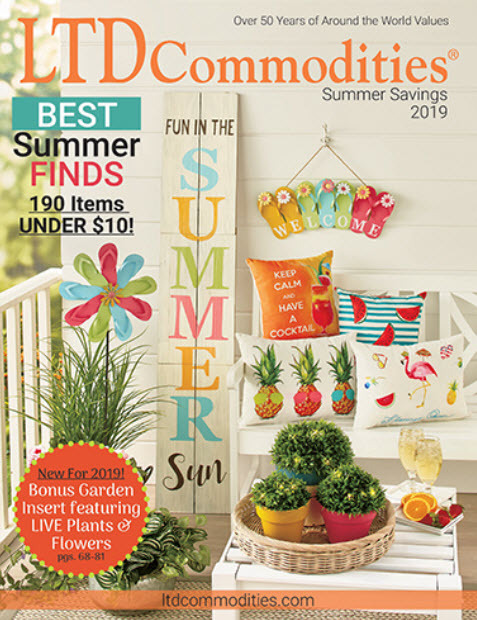 It’s a cute, easy way to accent any desk, shelf or mantel. 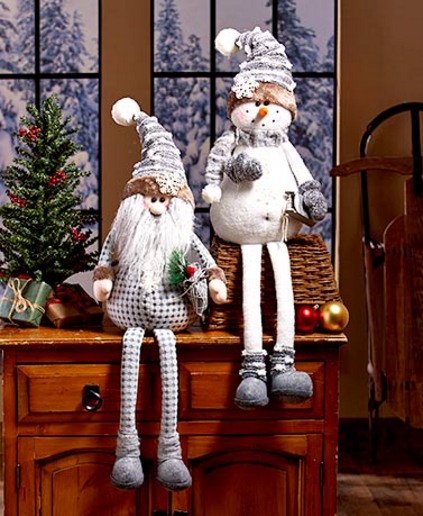 These decorative figurines are a delightful addition to your seasonal decor. 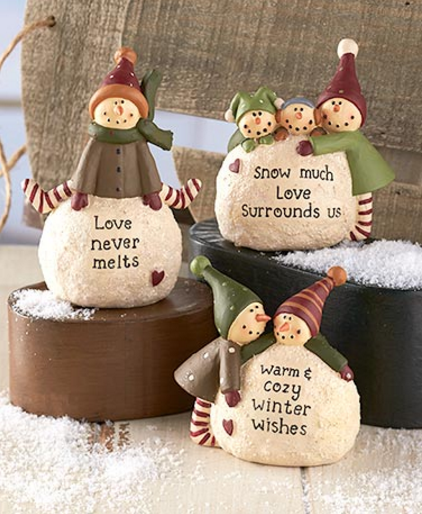 Each snowball is decorated with a sentimental phrase that’s perfect for the holiday. Place them together or separately to spread some cheer. Find the perfect Christmas glow for any room in the house. 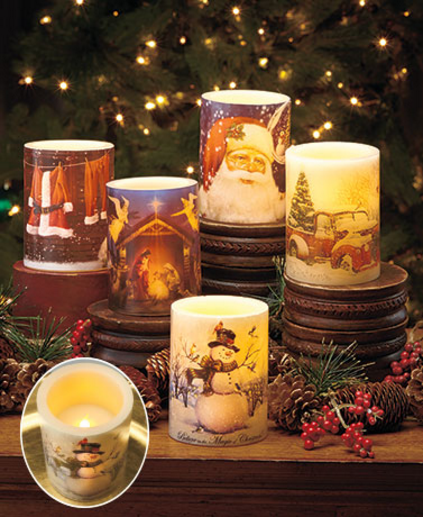 Create an adorable holiday display with these tea light holders. 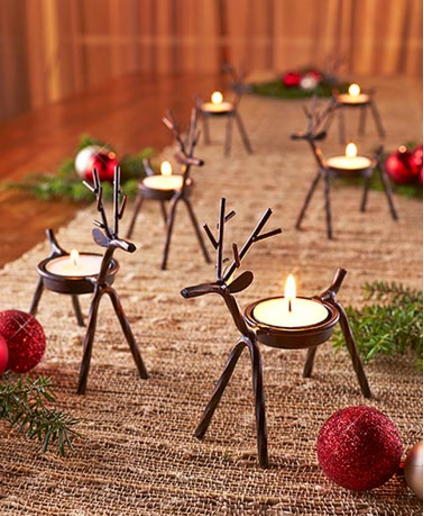 Each metal reindeer has a spot on its back to hold your own tea light or LED tea light candle. Keep the herd together or split them up around the house. 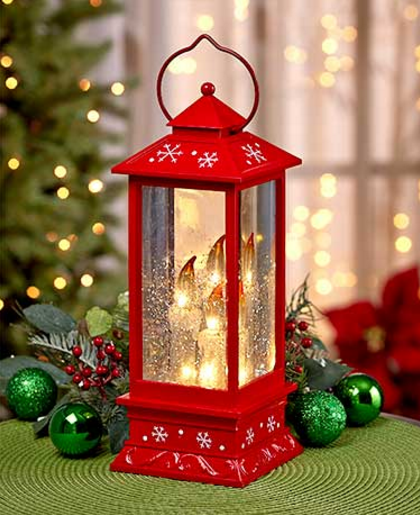 This candle lantern is destined to become your favorite winter decoration. It features faux candles inside that brighten with white light. Interior is filled with glittery liquid that moves around like a snow globe when it’s on. This flameless LED bulb flickers like the real thing, giving the wax candle a warm glow. It’s wrapped with a Christmas scene that will look perfect on a mantel or as part of your holiday centerpiece in the dining room.